Electronic devices have become such an important part of everybody’s lives. Every day, people everywhere perform the mechanical ritual of checking e-mails, text messages, Twitter accounts and other social media platforms. 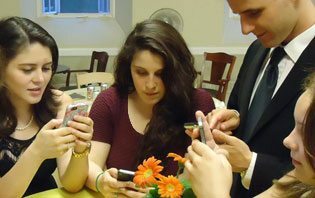 The constant desire to connect quickly becomes an obsession to the point that some people do not know when to stop and disconnect from their electronic devices. They even feel lost without them. Stopping to reflect about proper use of devices is important since dependence on them can have a dehumanizing effect. When people lose control of their usage, they no longer fully develop character, personal talents or even enjoy legitimate pleasures like conversation, silence or reflection. They lose touch with reality and human relationships. Of course, not everyone takes this dependence to the extreme. However, there are certain signs by which people can know when they have gone too far, and need to stop and take measures. 1. When You Feel Both Busy and Empty. You know you have gone too far when these devices contribute toward increasing the rhythms of life to the point that you feel busy and empty at the same time. Within a hurried pace of online life, time itself loses meaning. People experience the double sensation of having no time to do anything and doing nothing with their time. Without time to reflect upon and interpret experiences, life becomes all jumbled. People then experience the boredom, exhaustion and psychological stress that is so much a part of modern life. When this paradox of having no time yet wasting so much time strikes, it is time to stop, disconnect and think about how to use devices less or more constructively. 2. When it Becomes Addictive. According to a survey by the children’s advocacy group Common Sense Media, nearly 59 percent of parents believe their teenage children are addicted to their devices. Some 27 percent of parents consider themselves addicted. The devices that supposedly empower people now have power over people. The dependency is increasingly causing friction between parents and children, even to the point of daily arguments. It is changing the nature of family relationships and interaction. When internet addiction starts to affect your relationships and take huge amounts of your time, it is time to stop, disconnect and take measures. 3. When You Believe You Cannot Stop and Disconnect. You know you have to change when you feel you can’t take a break. Many people see and regret their addiction to their devices and the time wasted on them. However, they are blinded by myths that they simply cannot control their usage. They will believe that they are the only ones with the problem or that no one succeeds in disconnecting. They give up on making any effort based on these myths. It is then that people should stop and disconnect. Ironically, it is precisely at the time when people realizes the danger of technology overload that they are in the best position to disconnect. When people are mugged by the reality of their overuse, they see the problem with clarity. People should take advantage of this insight to become motivated to change their lives. People need to take courage from the fact that they are not alone. Millions of other Americans face the same problem. They are taking effective measures to limit their use of technology. Everyone can do the same. Those addicted to smartphone usage, for example, are going back to simpler phones. One out of every seven Americans are now using the so-called dumb phones that only make calls and send text messages. Some 24.2 million such phones were sold in 2015, many of them by those who wished to unplug. Other people are simply disciplining their time online to reflect realistic needs. The important thing to understand about technology is that it is there to serve humanity—not to be served. Technology should be used like a person on a horse who rides the horse towards a goal in life. Today, technology has become a wild horse who drags the fallen rider from the stirrup. When people start losing control, it is time to stop, disconnect and revaluate the use and abuse of their devices. It’s time to get back on top of the horse. This entry was posted in Fighting the Culture War and tagged 3 signs you need to stop, addiction, addictive, children, disconnect, electronic devices, internet addiction, obsession, parent, smartphone, social media, technology by John Horvat II. Bookmark the permalink.